A Southend airport hotel with excellent event facilities and a rooftop restaurantHoliday Inn® Southend hotel is close to London Southend Airport and nearby business parks.Leave your car while you travel with a Park, Stay & Go package. Direct trains from Southend Airport station, a 4-minute walk away, can whisk you to London's Liverpool Street station in under an hour. Southend's famous coastline, with its iconic pier, is a short drive away. Keep the kids busy at the Adventure Island amusement park, or check out the museum at Prittlewell Priory, a former monastery. Business guests can host events in our naturally lit, state-of-the-art meeting rooms or the impressive boardroom on the 5th floor, and we’re also a popular wedding venue.At this hotel you can enjoy:- Free WiFi- 24-hour room service- A pillow menu- Rooms with sofa beds for families- Kids stay and eat freeSavour modern British dishes overlooking the runway and the surrounding countryside in our 1935 Rooftop Restaurant, awarded an AA rosette. Grab a Starbucks coffee while you check your emails in the laid-back lounge, or work out in the mini gym. Our fully air-conditioned bedrooms include airport-view Superior rooms with super-king beds, as well as Standard, Executive and Accessible options. All of them are soundproofed for a peaceful night's sleep. Enjoy British cuisine at Pegasus, a restaurant which features a bar, or stay in and take advantage of the room service (during limited hours). Full breakfasts are available daily from 7 AM to 10 AM for a fee. Found in a classically grand building, the 3-star Park Inn by Radisson Palace Southend-on-Sea sits pm the Western Esplanade, overlooking the Thames, and is just a 7-minute walk to Southend Station. The on-site RBG Bar and Grill serves British and European classics, and you can unwind in the gym and spend an evening in the Grosvenor Casino. Rooms at the Park Inn by Radisson Palace Southend-on-Sea are colourful and contemporary, and have flat-screen TVs, free wi-fi and tea and coffee facilities. With a stay at Roslin Beach Hotel in Southend-on-Sea, you'll be next to a golf course, within a 5-minute drive of Adventure Island and Thorpe Bay Beach. 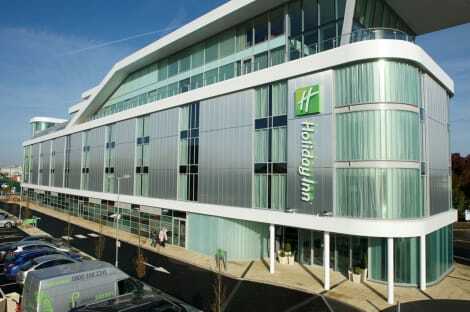 This 4-star hotel is 1 mi (1.6 km) from Southend Sea Life Centre and 1.4 mi (2.2 km) from Southend Pier. This classic seaside hotel in the heart of Southend-on-Sea has been refurbished in a modern style and is within easy walking distance of the pier. Treat yourself to classic cuisine in the on-site restaurant and relax in the lounge or the fitness room. Rooms are furnished in a modern style and have flat-screen TVs and free wi-fi. Situated on Eastern Esplanade, overlooking the Thames Estuary, The Waverley offers free parking and free Wi-Fi. With sea views . The hotel has bedrooms with flat-screen TVs. The cosy bedrooms at The Waverley are individually decorated and feature colourful art or floral prints. All rooms have tea and coffee facilities and a hairdryer, and some have wonderful sea views and en suite bathrooms. There are a number of restaurants, pubs and cafes just a short walk away. With an enviable seafront location, The Waverley Guest House is a 20-minute stroll along the parade from Adventure Island. Thorpe Bay Railway Station is just a mile away and Thorpe Hall Golf Club is a 15-minute walk. With a stay at The Beaches Guest house - Adults Only in Southend-on-Sea, you'll be within a 5-minute drive of Adventure Island and Thorpe Bay Beach. This guesthouse is 0.7 mi (1.2 km) from Southend Sea Life Centre and 1.2 mi (1.9 km) from Southend Pier. Staying in one of Southend-on-Sea's hotels with lastminute.com will see you in one of the UK's most famous seaside towns. The town is situated in the county of Essex, famous for its nightlife, at the mouth of the river Thames. The town's pier is one of the longest in the world, extending a mighty 1.3 miles out into the sea. If you spend the afternoon on the pier, then you won't be short of things to do. As you wander down its wooden path you'll pass plenty of fishermen, and you can even join in if the mood strikes you, for the small fee of a fishing pass. The pier's small train will take you from one end to another, and boards just by the pier's very own museum where you can learn about its history. Of course there are various events throughout the year, and if you time your trip accordingly you should be able to take in some live music or even a classic Essex Punch and Judy show. In the town itself you'll find a range of art exhibitions and museums for you to soak up a little culture on your trip away. Check out the Central Museum and Planetarium with the family for a fun and educational morning's viewing. If you want to sample Essex's famous nightlife, you won't have to venture too far from your hotel. Southend-on-Sea has been accredited for its night-time entertainment with the industry standard purple flag. Choose from a variety of cosmopolitan and modern restaurants, from Italian, such as Azzuro, to the trendy Chinese restaurant East. After you eat you won't be short of places to choose from to go for a drink. Chinnerys is the local venue for gigs, and plays host to big live bands and local talent alike. Book in advance to see some of the larger acts or turn up on the day to see some local talent.